This weekend’s forecast can be summed up in three words: Hot, dry and windy. On Thursday, temperatures were 10 to 20 degrees warmer than Wednesday, prompting the National Weather Service (NWS) to issue a heat advisory early, according to NBC 7 meteorologist Dagmar Midcap. On Friday, temperatures will be around 89 degrees at the coast and 99 degrees inland. “We’re going to see high pressure build in this region, and that will dominate the weather pattern at least through the weekend,” Midcap said. Cal/OSHA has issued a high heat advisory, which means employers must provide workers with plenty of water and a shaded spot to take breaks. Also, there are more than 100 designated “cool zones” across San Diego County for people without air conditioning. The heat advisory remains in effect until 8 p.m. Sunday, according to NWS. Besides the hot temperatures, moderate winds and single-digit humidity in some areas mean risk of wildfires. October is typically the most dangerous time of year for wildfires in San Diego County. This weekend, Cal Fire has extra crews on equipment and at stations around the county. An extra air tanker is on loan from Northern California. They'll also have round-the-clock staffing on five water tenders and bulldozers, according to Cal Fire. 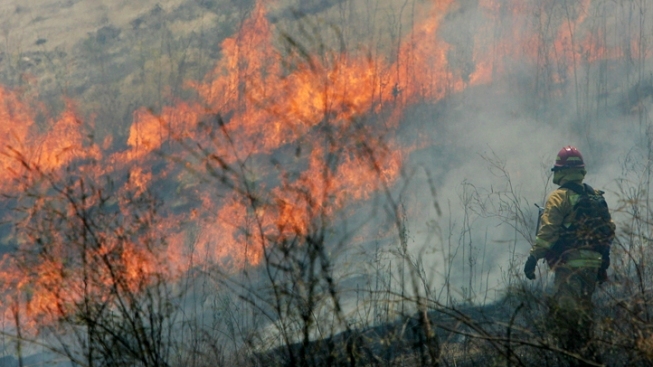 A small brush fire was reported on Camp Pendleton Thursday evening. Smoke could be seen in Bonsall and Fallbrook, according to North County Dispatch. Cal Fire is asking residents to use common sense this weekend, for instance, not using power tools outside and being mindful of where you toss cigarette butts.